In my eternal quest to find a massive optical illusion to rival the famous Face of Mars, we may have finally found a winner. 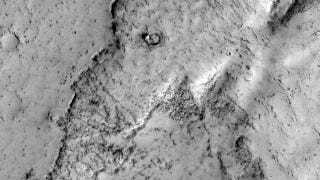 Ladies and gentlemen, meet the Elephant of Mars, as spotted by NASA's Mars Reconnaissance Orbiter. This is a good example of the phenomena "pareidolia," where we see things (such as animals) that aren't really there. Actually, this image covers the margin of a lava flow in Elysium Planitia, the youngest flood-lava province on Mars. Flood lavas cover extensive areas, and were once thought to be emplaced extremely rapidly, like a flood of water. Most lava floods on Earth are emplaced over years to decades, and this is probably true for much of the lava on Mars as well. An elephant can walk away from the slowly advancing flow front. However, there is also evidence for much more rapidly flowing lava on Mars, a true flood of lava. In this instance, maybe this elephant couldn't run away fast enough. The elephant doesn't have quite the same eerie, otherworldly quality of the Face of Mars - apart from the fact that both are quite literally on other worlds, of course. But the one thing it's got going for it is that it still looks like an elephant's head - complete with correctly positioned eye! - even at these high resolutions. The Face, on the other hand, looks way less impressive and face-like if you actually see it up close, which the HiRISE camera actually did a few years back.